Celebrate the Season at Durand-Hedden - December 6, 2015 ~ The History Girl! 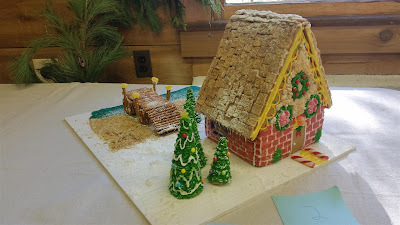 All ages will enjoy the 2015 display of inventive entries to the annual Durand-Hedden Gingerbread House Competition on December 6 from 1:00 - 4:00 pm. Interested in being a contestant? Enter by December 3. See announcement below and www.durandhedden.org for details and entry form. Don’t forget to bring a camera to catch a photo of your children with our real live “Victorian Santa.” Shop the Country Store, open every Saturday and Sunday from noon to 5pm, to find inexpensive and unique gifts for family, friends and teachers, while benefiting the Durand-Hedden House. The historic-themed selection includes: early American children’s games and toys, facsimile documents, quill pens and ink, historic cookbooks, cookie molds, tin lanterns, reproductive decorative items and ceramics, and more. Original 1910 Fudge Sauce, local honey, and the hard-to-find original Doors of Maplewood poster, Smile, the history of Olympic Park, and the new newly reproduced 1931 map of Maplewood will also be available. No need to go to the mall! The Durand-Hedden house invites bakers and confectioners of all ages – individuals, families, food professionals – to take part in its 2015 Gingerbread House Competition. Any structure – real or imaginary – is eligible. Visit www.durandhedden.org for more information and to register. The deadline is December 3. Winners will be revealed at the December 6 open house. Entries will be exhibited at Durand-Hedden on December 6, the weekend of 12 and 13, and then at the Hilton library branch from December 14 to January 16.